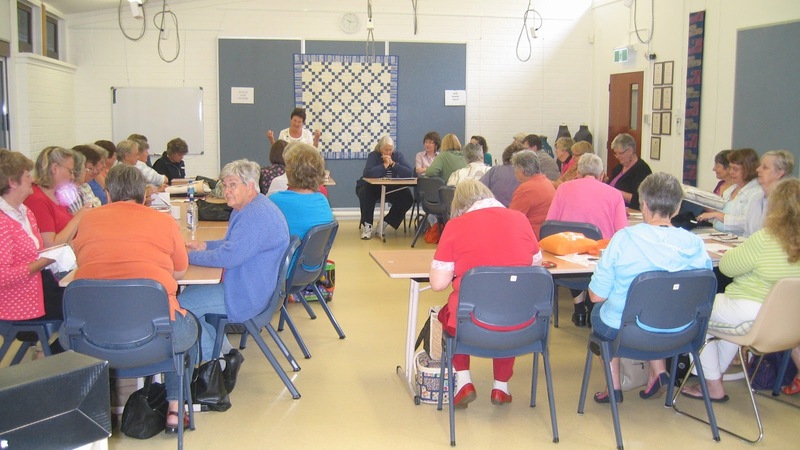 Rowmakers group kicks off for 2012 | Canberra Quilters Inc. The first meeting for the Rowmakers was on 8 February. The Rowmakers started last year, making a row-by-row quilt throughout the year. This was the set-up meeting for the rest of the year. It was well attended, as can be seen by the picture below. We also have a number of members participating “by correspondence” as they can’t make it to the second Wednesday. This year the design challenge will focus on feature blocks, although participants can make more each month and go with rows. Each month three elements will be selected and you have to incorporate at least two of the three. What a great meeting! Thanks to everyone who turned up and the positive attitudes. I’m pleased to see we haven’t suddenly become quiet. What we need is the decibel meter from the Australian Open. I’m sure we’d beat Sharapova but maybe not Azarenka! Remember that you only have to include two of the above, but you can include all three if you wish. And flexibility and interpretations are encouraged. Hope to see all of you at our next meeting on Wednesday 14 March. See you on the 14th with your completed block. After the meeting, the library will be open until 1.00pm.